The symposium celebrates a milestone: four years of innovation generously funded by the Andrew W. Mellon Foundation. The grant allowed faculty and students to “shift boundaries” in teaching and scholarship at Wellesley College: 50 faculty, representing 21 academic departments, partnered with Library and Technology staff, spearheaded projects and revisited their teaching and scholarship with the help of digital tools and methods. In addition, the Digital Humanities Program has been created as an interdepartmental hub for faculty interested in exploring digital humanities as a varied and rapidly evolving field. As part of the Blended Learning Speaker Series, we have brought to campus speakers from US and international institutions, as well as sponsored faculty presentations at conferences and participation in workshops. 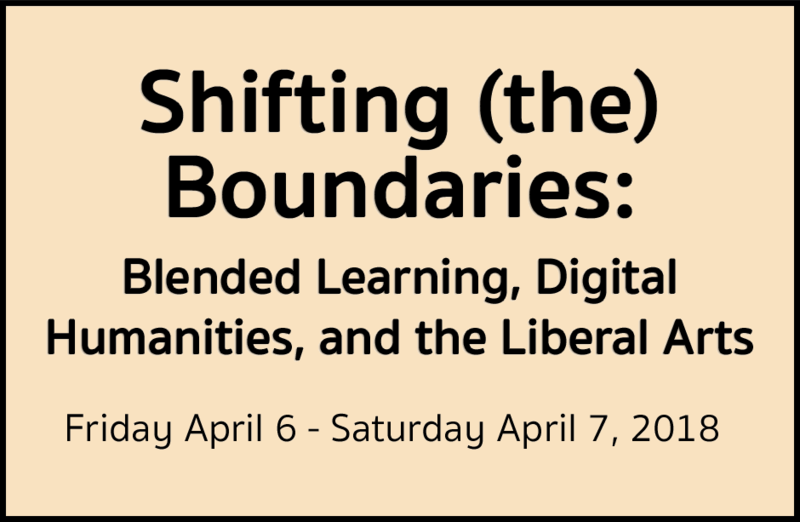 The symposium is an opportunity for our community and guest participants to reflect on the current state of blended learning and the digital humanities, both at our institution and across academia. The intentional use of the article “the” in parentheses in our symposium title, “shifting (the) boundaries,” underscores both our active participation in negotiating the spatial, disciplinary, and methodological boundaries in our scholarship and teaching, as well as the broader perspectives of how digital methods are transforming humanistic practices across academia. We invite participants to collectively reflect on questions such as: How has scholarship and teaching in the digital humanities challenged traditional boundaries between the humanities and the social sciences and sciences? How have digital tools led to new collaborative partnerships and altered research practices? What gender, economic, and race-specific boundaries have we encountered and what opportunities for inclusion does blended learning and the digital humanities offer? What is the continued promise of blended learning and the digital humanities, but also what are the challenges digital methods present, especially in the context of a small liberal arts college? We will also turn to more practical questions, such as how to evaluate digital projects and publications for promotion, or how to assess student learning and the benefits and disappointments of one open-sourced tool over another. These conversations will necessarily touch on the morphing and blurry definitions attributed to Blended Learning and the Digital Humanities, recognizing the tricky—and often polemical—task practitioners face when drawing boundaries between these terms. The symposium is free and open to the public. Please register by March 31 to help us with the planning. Questions? Contact Evelina Gužauskytė (eguzausk@wellesley.edu) or David O'Steen (dosteen@wellesley.edu). To learn more about the Blended Learning Initiative at Wellesley College, visit the Blended Learning Initiative website. If you need disability-related accommodations, please see Wellesley College Accessibility and Disability Resources or email accessibility@wellesley.edu.